It’s almost Groundhog Day. Does that mean Grand Master Kevin Cheveldayoff is about to poke his head out of his hiding hole and do something? Or say something? That would be refreshing, since the man who does Saint Mark Chipman’s bidding hasn’t done or said much of anything since shuffling Evander Kane and Zach Bogosian off to Buffalo. For those of you keeping score at home, that was almost 365 days ago. Chevy is the Howard Hughes of National Hockey League general managers. A recluse. He is the anti-John Ferguson. When Fergy was at the wheel during the Winnipeg Jets’ initial whirl in the NHL, he took ownership of his deeds. Good (hello, Dale Hawerchuk) or bad (hello, Jimmy Mann). He didn’t hide from the faithful or news scavengers. From the moment he arrived in River City from Gotham until the day he was asked to leave, Fergy was up front and loud. His was the face and voice of the franchise. What we now have with Cheveldayoff and the present-day Jets is complete non-accountability. What I find myself wondering is this: Is Cheveldayoff standoffish by nature, or is he under some sort of gag order issued by team co-bankroll Saint Mark? I mean, it’s one thing for Chipman to operate a secretive society that suckles at the public teat in the form of tax advantages/subsidies and gaming revenue, but this isn’t about True North Sports & Entertainment profits. It’s about a hockey team, one in which the community has invested deeply, whether through ticket/merchadise sales or emotions. What is he afraid of? If Chipman hasn’t instructed Cheveldayoff to keep his lips zipped, what is the GM afraid of? Answering a few questions in advance of a looming NHL trade deadline ought not be an option. It ought to be an obligation. On a similar theme, it was interesting to read dispatches from this weekend’s NHL all-star hijinks in Twang Town, Tennessee, because we discovered a side of Dustin Byfuglien seldom, if ever, seen in Winnipeg. Turns out Big Buff is humorous, witty, glib and an all-round nice guy who seemingly enjoyed his 25-minute parry-and-thrust with hockey scribes on media day. That Nashville scene, of course, would never take place in River City, because the Jets are so freakish about controlling the message that they shield their players from prying eyes and ears. News scavengers aren’t granted the opportunity or time to get to know players like Byfuglien as people and, by extension, Joe and Josephine Phan are also left out of the loop. Shame, that. Not surprisingly, the Big Buff chin wag referenced his contract negotiations with the Jets. The all-star rearguard and pending free agent was asked point blank if his desire was to remain in Winnipeg, and, while he had some favorable comments about good, ol’ Hometown, part of his reply likely left a few in Jets Nation a tad uneasy. “I just want to put on a jersey, to be honest with you.” He didn’t say a Jets jersey. Apparently, any NHL jersey will do. 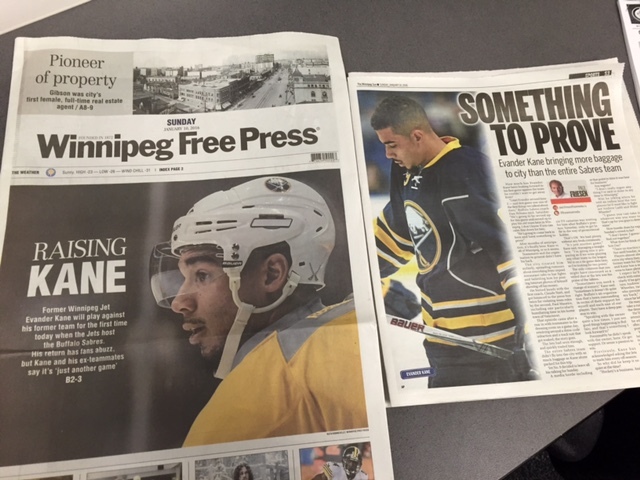 He later said, “I wouldn’t want to go anywhere else, but business is business.” Reminds me of the answer Evander Kane delivered in July 2014 when Team 1040 Radio in Vancouver quizzed him on his status with the Jets: “Well, I think, um, I’m a Winnipeg Jet right now and, um, you know there’s been speculation and rumors for the three years since I got there. You know, we’ll see what happens, and we’ll carry on as if I’m a Winnipeg Jet.” We all know how that ended. Sad, but not surprising, that there’s no Winnipeg Sun presence in Nashville. The tabloid was served by the Toronto-based Michael Traikos of Postmedia and Mike Zeisberger of the Toronto Sun. Get used to it, people. Meanwhile, the Winnipeg Free Press has its own man, Tim Campbell, on site. Score one for the Freep. Best reads this week were delivered by the Freep’s Paul Wiecek, whose piece on Saint Mark Chipman is superb. It’s Wiecek at his best and a prime example that the Free Press is well-served with him in the columnist’s seat. Meanwhile, the much-maligned John Scott told it like it is in a Players Tribune article that offers insight and humanizes one of the NHL’s dying breed—the enforcer. Tell me if this is coincidence or an attitude adjustment: On Jan. 7, the NHL dinged Nikolaj Ehlers $2,000 for diving/embellishment. It meant he was a repeat offender. To that point in time, the diving Dane had scored six goals and 13 points in 40 games. Since the NHL dipped into his pay envelope, the Jets freshman winger has scored six goals and collected nine points in nine games. Apparently, Ehlers has concluded that staying on his feet is more productive than flopping around like a European soccer player. Skating alongside linemates not named Chris Thorburn likely helps, too. 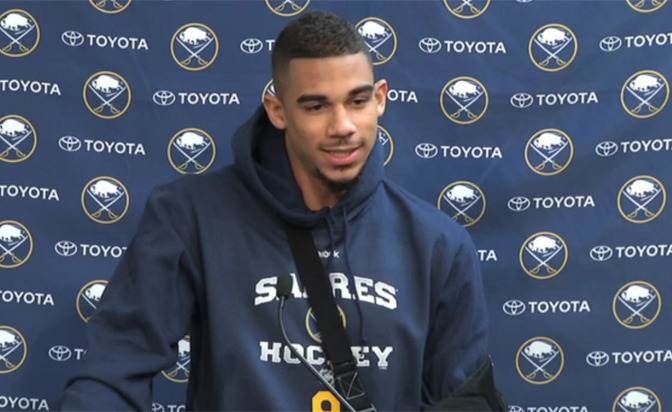 Top o’ the morning to you, Evander Kane. I must say, it’s been awful quiet in these here parts ever since you packed your track suit and shuffled off to Buffalo. The boys you left behind are quite the bland lot. I mean, the surviving members of the Winnipeg Jets all pay their restaurant and bar tabs. They pay their parking tickets. They don’t swan off to Las Vegas and tweet selfies featuring great gobs of American greenbacks. They don’t buy billboards on Sunset Strip in Tinseltown to woo back their model girlfriends. All they do is kiss Saint Mark Chipman’s ring finger and play hockey. Bor-ring. I was kind of hoping that your return to Pegtown for the Buffalo Sabres-Jets joust this afternoon at the Little Hockey House on the Prairie would liven things up. You know, get our motors running. But you didn’t play along. Your chin-wag with news scavengers upon your return to River City was as ho-hum as your offensive output this National Hockey League season. Just another game, you said. Business as usual, you said. It’s never “just another” anything when you and Winnipeg are in the mix, Evander. You had a love-hate relationship with us. Sans the love. You wanted out of River City the moment your eyes made acquaintances with Portage and Main. But you lied to us about that, didn’t you, Evander? You said everything was cool. You even signed a long-term contract that, as we have since learned, was window dressing and not an indication that you liked us, you really liked us. It’s not quite a year since the trade that sent you from one NHL backwater burg to another and, other than a wardrobe adjustment from Jets to Sabres linen, not much has changed for you, Evander—eight goals and five assists in 30 games, pauperish returns for princely pay. Still, I miss you and your underachieving ways, Evander. You were interesting. Fun. A walking, talking, 72-point headline. That’s why you’re in for a rough ride this afternoon. The rabble in River City prefers their sporting heroes to be humble. Modest. Feet on the ground, not nose in the air. You made too much noise, Evander. The wrong kind of noise. And now you’ll be hearing a different kind of noise at the Little Hockey House on the Prairie. It won’t be pleasant and it won’t be polite. But I suppose it will be befitting. No. 33 is no fan of 3-on-3 shinny. So, the successful side in this month’s NHL all-star hijinks in Twang Town, Tennessee, divvies up a $1-million pot of gold. That would be one million U.S. dollars, or about one million, 400,000 loonies. 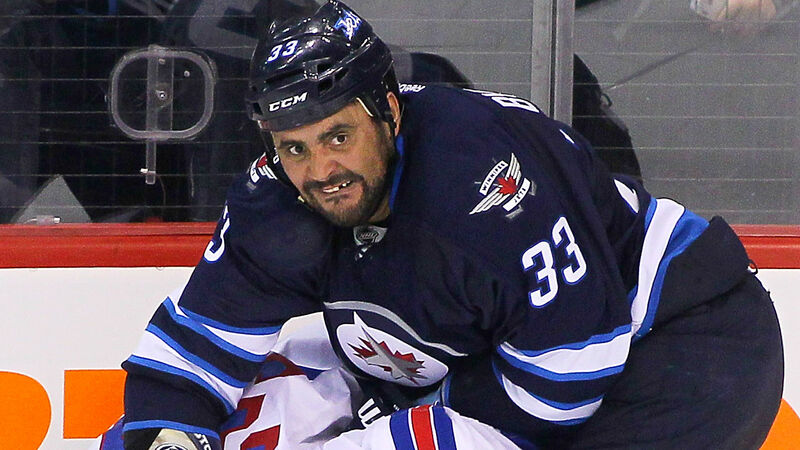 Something tells me that Dustin Byfuglien suddenly is a fan of three-on-three hockey. Big Buff, of course, harrumphed mightily earlier this season after he and the Jets had been beaten in a three-on-three overtime session. It’s not hockey. It’s terrible. It’s stupid. Fine, Buff. Remind us of that when you and your Central Division colleagues are counting the cash in Nashville. Speaking of cash, I note that Jets’ freshman Nikolaj Ehlers is a bit lighter in the wallet these days. The NHL dinged the not-yet-great Dane to the tune of $2,000 for diving/embellishment, which means he’s a repeat offender. Somebody tell the swan-diving Dane that the pond is frozen. You want to embellishment something, kid? Try your scoring numbers. You had four goals before we carved our Halloween pumpkins. Then you turned into a pumpkin. You’ve scored two since, one into a empty net. Stay on your feet and play the game, Swanny. Why all the angst over the Jets getting an early first-round pick in June’s NHL entry draft? If grand master Kevin Cheveldayoff is such a wizard on the draft floor, it shouldn’t matter whether he gets his initial call in the top 10, middle 10, or bottom 10 of the first round. Who is Ken Wiebe of the Winnipeg Sun trying to fool? Following the Jets’ 4-1 faceplant against the Disney Ducks in Anaheim, he wrote, “Faced with a back-to-back situation, the Jets were unable to find their skating legs against a well-rested Ducks team.” Really? Well-rested? Wiebe surely is not letting the facts get in the way of his reporting, because the Ducks were playing their fourth game in six nights. Same as the Jets. Up to and including that game, the Ducks played nine matches from Dec. 17-Jan. 3. The Jets played eight. The Jets played five road games during that stretch. The Ducks played seven, including four on the opposite side of the continent. It was the Jets’ fifth post-Christmas game. Ditto the Ducks. So, exactly when did the Ducks have time to rest? Wiebe’s comment smacked of homerism. Local sports scribes who wrote articles this week that did not include the sport and/or league they were writing about: Ed Tait, Tim Campbell, Melissa Martin, Scott Billeck, Jeff Hamilton, Doug Brown, Ken Wiebe, Paul Friesen. Prediction: By the end of this month, the Jets will be in a playoff position. Seriously. The Nashville Predators have gone into free fall and the Colorado St. Patricks are legitimate like Jaromir Jagr is a rookie. About the only thing I can see screwing up the Jets this month is the return of Ondrej Pavelec. The Drab Slab recruits Scott Campbell…nothing new at the Sun…still a hate-on for Shane Doan…and why not Anthony Peluso in the NHL all-star game? So, how does one improve upon the toy department of a daily newspaper? Why, you recruit a non-writer to write, don’t you know? That, at least, is the thinking of the madcap minds at the Winnipeg Free Press, which now has more sports scribes than Donald Trump has critics. Latest to join the Drab Slab’s stable of thousands is old friend Scott Campbell, who, when last seen, was helping the Winnipeg Jets wrestle the final World Hockey Association championship away from the Edmonton Gretzkys, then, sadly, he fought a losing battle with asthma that ended his National Hockey League career at the tender age of 25. 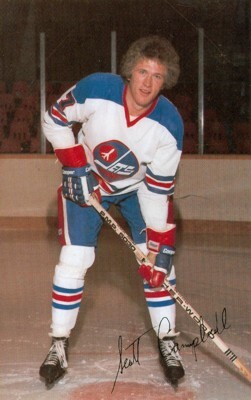 Scotty was one of the good guys, one of my all-time fave Jets. A raw-boned rearguard, he was friendly, witty and quick with a laugh. He took his game seriously but not himself. And what will he bring to the Freep sports pages commencing Friday? Honesty. Bluntness. I hope. I say that based on Scotty’s scribblings at Mitch Kasprick’s pride and joy, Winnipeg Hockey Talk. He doesn’t write with the smoothest pen (copy editors, please take note: punctuation is not Scotty’s strength), but he offers unvarnished critique, fair analysis and the voice of someone who has been there, done that. My main concern is this: Given that the Freep is in bed with the Jets (official newspaper and all that rot), will Scotty be writing in a harness or given free rein? If he’s expected to be a True North Toady, it shall become a wasted exercise. If allowed to ruffle feathers, it’s game on. Go get ’em, Scotty. I’m root, root, rooting for you. So now the Drab Slab has one ex-jock, Campbell, scribbling hockey, and another former play-for-pay guy, Doug Brown, prattling on about the Winnipeg Blue Bombers and all things Canadian Football League. How do they compare as writers? Scotty is meat-and-potatoes. Brown is…well, let’s just say the former defensive lineman is from a school that preaches, “Why use just three words when three dozen are so much better?” Basically, just one thing separates the two—a thesaurus. In advising readers that the Freep toy department is “upping its game” by bringing a novice on board, sports editor Steve Lyons also invited feedback. Or input, if you will. “How are we doing?” he asks. “Is there something you would like to see more regularly? Is there something you would prefer to not see at all?” Well, now that you ask, Steve…is it too much to expect from your scribes (also copy editors) that they adhere to the basics of writing? You know, the who, what, when, where and why of a story. It’s disgraceful and shameful that Freep writers repeatedly fail to mention the league or sport they’re writing about. It’s an every-day occurrence. This is a pet peeve of mine and I’m not going to let it go until I see them spell it out—every day, in every article. I keep waiting for the Winnipeg Sun to add a fresh voice to its sports pages, but it remains same old, same old—Paul Friesen, Kirk Penton, Ken Wiebe and cameo appearances by Ted Wyman. Those boys do boffo work, but even following the Freep’s lead and finding someone to do a once-a-week gig would give the Sun a bit of a jolt. As it is, they continue to trot out the weekly Toronto-centric, three-dot ramblings of Steve Simmons each Sunday. Do people in River City really care about the goings-on in the Republic of Tranna? I think not. I enjoy reading quick-hit journalism, but I’d rather it be about good, ol’ Hometown rather than big, bloated Hogtown. 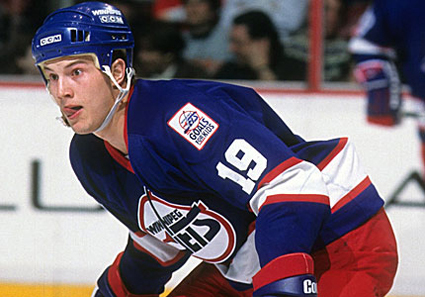 Shane Doan as a rookie with the Winnipeg Jets. It occurs to me that there remains a pocket of people in Pegtown still harboring a fierce hate-on for Shane Doan. Why is that? I mean, it wasn’t his fault that a bunch of carpetbaggers took Winnipeg Jets 1.0 and hightailed it south to the Arizona desert in 1996. Doan went along for the ride, simply because he had no choice, and the fact the Arizona Coyotes’ captain broke Dale Hawerchuk’s franchise goal-scoring record last week ought to be saluted, not scorned. I mean, are we really still bitter about the NHL allowing the Jets to skulk out of town and morph into the Desert Dogs? Are the Jets 2.0 not a suitable consolation prize? Get over it, people. I can think of a few things that would put my nose out of joint, but John Scott appearing in the NHL all-star game isn’t among them. Sure it’s farcical that the Arizona Coyotes’ resident rottweiler will be part of the glittersome gathering in Twang Town, Tennessee, at the end of the month, but what is the NHL all-star skirmish if not farce? Seriously. A hockey game with a football score is not a purist’s idea of quality shinny, which is why it’s no longer a single farce but a series of little farces. So why not let the goons in on the fun? What the hey, had Jets loyalists been on the ball, they would have stuffed the ballot box and sent Anthony Peluso to Nashville, whereupon both he and Scott could lay a hurtin’ song on the real hockey players. Unless there is a dramatic change in fortune, we soon shall hear much talk of tanking in Jets Nation. For the record, I don’t believe that team co-bankroll Mark Chipman will instruct grand master Kevin Cheveldayoff to deliberately tank in order to better position the Jets to win the right to bark out the name Auston Matthews at the 2016 NHL entry draft. If the Jets get first shout at the June garage sale of freshly scrubbed teenagers, they’ll do it the old-fashioned way—bad management. Author pattidawnswanssonPosted on January 3, 2016 January 3, 2016 Categories Sports, Winnipeg Free Press, Winnipeg JetsTags Anthony Peluso, Arizona Coyotes, Auston Matthews, Canadian Football League, Doug Brown, John Scott, Ken Wiebe, Kevin Cheveldayoff, Kirk Penton, Mark Chipman, Nashville, National Hockey League, NHL all-star game, NHL Entry Draft, Paul Friesen, River City, Scott Campbell, Shane Doan, Steve Lyons, Steve Simmons, Ted Wyman, Toronto Sun, Winnipeg Blue Bombers, Winnipeg Free Press, Winnipeg Sun, World Hockey AssociationLeave a comment on The Drab Slab recruits Scott Campbell…nothing new at the Sun…still a hate-on for Shane Doan…and why not Anthony Peluso in the NHL all-star game? The floating rumor that Mark Chipman is a buttinski is not a rumor at all. It is fact. The Winnipeg Jets’ co-bankroll and governor sat at a round table last month and admitted as much during a no-necktie chin wag with George Stroumboulopoulosboulopoulos, Hockey Night in Canada host and unabashed citizen of Habs Nation. What we don’t know is this: How much of a buttinski is Mark Chipman? Could it be that Saint Mark is the reason Andrew Ladd and Dustin Byfuglien remain unsigned, untraded and destined for unrestricted free agency, at which time the Jets shall receive diddly for two of the National Hockey League club’s more prominent pieces? I mean, based solely on his comments to Stromboy, Chipman has stuck his beak into the seemingly stalemated to-and-fro between Grand Master Kevin Cheveldayoff and the camps of Ladd and Byfuglien. So, is Chipman asking Cheveldayoff what he’s doing, or has he gone all Steinbrenner and is telling his general manager what to do? It should be pointed out that this was not a one-on-one tete-a-tete between Saint Mark and Stromboy. Also flapping their gums were Geoff Molson, a product of a family of beer barons and le grand fromage of les Canadiens de Montreal, and Jeff Vinik, noted philanthropist and the money behind the Tampa Bay Lightning. It’s interesting to note that both Molson and Vinik are clear in stating their modus operandi: They bow to the expertise of their respective general managers and get the hell out of the way. Not so Chipman. He confesses that the more “impactful” the scenario, the more he sticks his thin, pointy beak where it doesn’t belong. Ya, sure, he owns the franchise and, by default, he must be made privy to the status of talks. But he’s not a hockey man. Having the largest office and a partner, David Thomson, with the deepest pockets in Canada doesn’t make Chipman any more knowledgeable than the lumps who sit on stools in sports bars or phone Radio Chin-Wag to promote conspiracy theories about sinister NHL skunk skirts plotting to keep the Jets below the playoff line. Chipman has had a free ride from mainstream media and fans since the Atlanta Thrashers caravan rolled into River City and morphed into Jets 2.0 in 2011, but he must be called out if we find his fingerprints on the final reckoning of major trades and signings. He has to do what Molson and Vinik do—get the hell out of the way.